Joining and Welding Services are manufacturing services used in the assembly of metals, plastics, glass, etc. to create weldments, electronic circuits, acrylic enclosures, etc. Services include welding, brazing, soldering, bonding, and mechanical joining. Among these, welding, brazing, and soldering most commonly refer to the joining of metals, though welding of plastics is not uncommon. The three joining methods are distinguished mainly by the temperatures at which they are performed, with welding being the hottest and soldering being the coolest with brazing somewhere between them. The other joining services, bonding and mechanical joining, cover non-heat or heat-plus related methods. Bonding is a typical method of attaching friction linings to brake and clutch shoes, and represents a primary ability of bonding to join dissimilar materials. Mechanical joining services cover any kind of joining involving rivets, threaded fasteners, stakes, etc. A typical mechanical joining service might be the installation of captive fasteners. Joining and welding services offer alternatives to many other manufacturing process such as machining, casting, molding, etc. They are well suited to small production runs because they can be labor intensive, particularly if the process is performed manually. 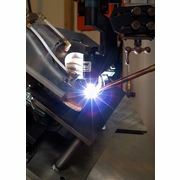 Large scale welding jobs are often automated using robotic welders. The same can be said for mechanical joining. Soldering in the electronics industry too is often automated. Welding is a process of joining mainly metals and sometimes plastics through heat applied through a variety of means that raises the material temperature above its melting point. Brazing Brazing is similar to welding in that it is a metals joining technique, but takes place below the melting point of the material. Soldering is a low temperature joining process that uses low melting point filler to mechanically join metals such as copper and silver. Bonding uses mostly adhesives to join like and dissimilar materials unsuited to heat-based joining process, and as an alternative to riveting or mechanical fastening. Mechanical Joining involves screws, bolts, rivets, etc. to join a variety of parts and products and differs from other joining techniques because of its ease of disassembly.